You can track time for others in Productive. Tracking time for your team is possible through the company time tab. Sometimes you might need to track time for your team members. Productive allows you to do that but it's not something we recommend - everyone should be responsible for their own time entries. However, there are some cases where it's necessary to have the flexibility of logging time for others. 1. You just started testing Productive - a lot of the reports in Productive are related to billable / non-billable time entries. Adding some time entries for team members will give you better reports and allow you to simulate your organization better. 2. Your manager delegated his time tracking to you - if this is the case, you can track time for your supervisor. If you have the admin or manager role in Productive, you can easily add time entries for all your employees. 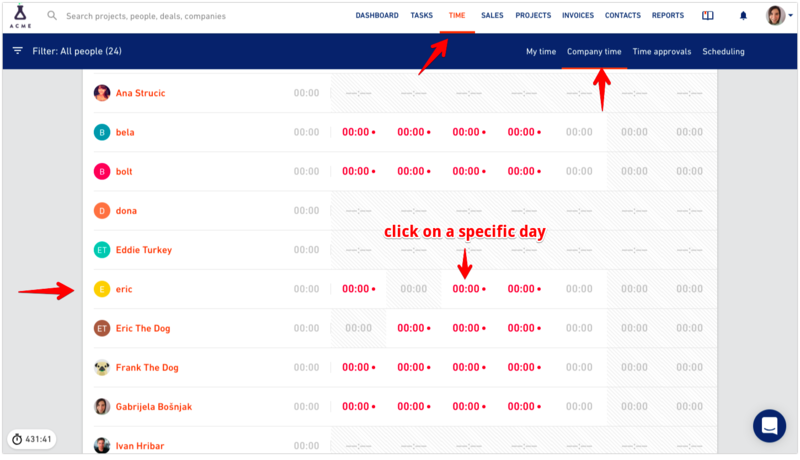 Step 1: Click on Time > Company time and click on a specific day that is in line with a team member's name. Step 2: When you click on this specific day, the layout for adding hours will be the same as if you were tracking your own hours. You need to choose a project and service he has worked on, and add how many hours he spent working on it. Once you've added the hours to your team, they will be assigned to the project and you will get accurate insight into how time and money is being spent on that project. You can also edit those time entries, change the difference between billable and non-billable hours as well as view them by time period, team member or a particular service. Wondering how? Find out more here.